in his honor promoting food service excellence between the military and industry experts. A. The Hoover Commission was established by President Eisenhower to study ways to improve the efficiency of government agencies. One such agency was the Department of Defense. One task group was charged with making improvements to commissary (principally the troop element as opposed to the retail stores) and troop feeding programs. Among other recommendations, the task group suggested that services initiate a competition among food service operations that would identify and reward the best ones. 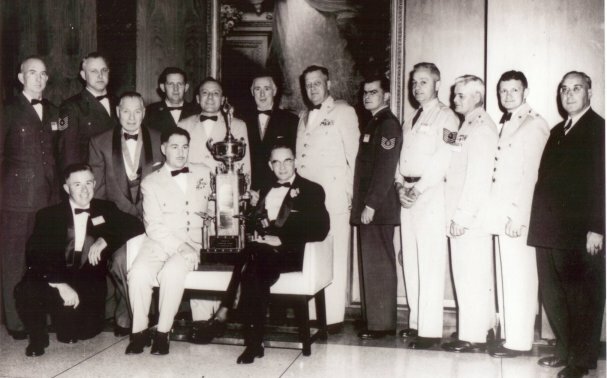 The Air Force was the first to implement the recommendation and establish a program that would become known as the Hennessy Trophy Awards Program. The program was named in honor of John L. Hennessy who was a member of the task group. Other members were Vernon Stouffer and Perry Shoemaker. B. John L. Hennessy - Recognized by US presidents as a leader in his field, John Lawrence Hennessy was one of the nation's most capable and respected hotel and restaurant executives. Born in <?xml:namespace prefix = st1 ns = "urn:schemas-microsoft-com:office:smarttags" />Angola, New York, in 1886, he began working in hotels as a freight elevator operator. He worked his way up through the ranks to become Vice President of Statler Hotels in 1928 and the Chairman of the Board before World War II. When Hilton Hotels Corporation absorbed Statler Hotels, he became Vice President of Hilton, the largest hotel corporation in the world at that time. 1. When we entered World War II, mobilization efforts presented many challenges. 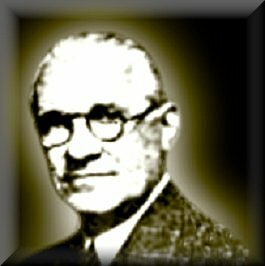 In 1943, President Roosevelt appointed Mr. Hennessy as Chairman of the War Food C ommittee to develop food service systems capable of sustaining millions of military personnel. He became the Special Food Consultant to the Secretary of War and was a member of the National Meat Board, controlling meat production and processing during the war. As a member of the Restaurant Industry Advisory Commission to the Office of Price Administration, his expertise was used during food rationing due to wartime needs. 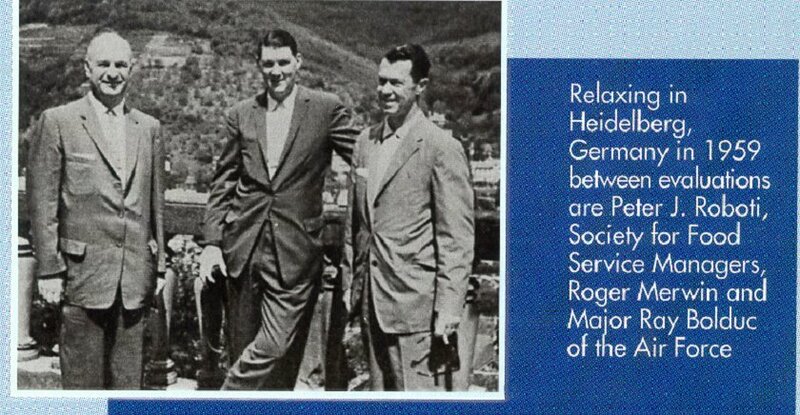 In 1946, he engaged in fund-raising activities in the hotel industry, supporting Disabled American Veterans. 2. In 1952, with the advent of the Nuclear Age, Mr. Hennessy served as a special food consultant to the Atomic Energy Commission at Los Alamos, New Mexico. He evaluated the impact of nuclear radiation on food products. He was appointed to the Hoover Commission. Their tasks included improving military food service operations. One of Mr. Hennessy’s recommendations was to encourage the military services to adopt a program of food service competition and inspire better management and command support of food service. Mr. Hennessy did not live to see his recommendation in action. At the time of his death, he was working on the design of the cadet dining hall at the Air Force Academy. 3. The memory of John Lawrence Hennessy lives on in the annual Air Force Hennessy competition—a testimonial to his efforts in the food service field. 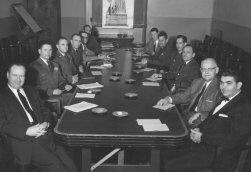 C. The Services office at Wright-Patterson AFB, OHIO starting in 1953 conducted food service conferences. The first two of these conferences had subcommittees that were charged with developing the ground rules and procedures for an Air Force food service competition. They did develop the outlines and members of the Services office staff then completed the program. Early participants were Lt Col John Oroszi, Capt Walter Pienkowski, and Roger Merwin. D. Early industry participants in the program start-up were Ralph Kuenning, National Restaurant Association (NRA), Phillip Connelly, International Food Service Executives Association (IFSEA), and Dan Robertson, Society for Foodservice Management (SFM). The Air Force participants were Lt Col Vernon Cordell and Maj George Fowler of HQ USAF, Washington, DC. A. The original idea was to enlist the assistance of outstanding restaurateurs to assist with the program. It proved difficult to reach out and find individuals who had the time and money to travel. It was suggested that a better approach would be through industry-related trade associations. Since several members of the Hoover Commission task force were active NRA members, the NRA was invited to participate. A strong local chapter of the IFSEA in Dayton suggested that they too would be interested. Also present in Dayton was NCR, who was a member of National Industrial Cafeteria Managers Association (now SFM). They suggested that they also might be interested, and they were invited. At that time each of the associations represented a specific element of the food service industry, thus, providing a balanced approach. Each of the organizations agreed to select representatives to be on the evaluation teams. B. The first few presentations were hosted by one of the organizations at one of their conventions. There was no sponsorship, but simply to act as host and make arrangements incident to the presentation. Several years later a serious conflict in Association convention dates and the evaluation schedule suggested that there would be an advantage to one organization acting as host (sponsoring) organization for several years running. The NRA was requested to be the sponsor for a five-year period to provide the continuity and stability desired. A Memorandum of Understanding (MOU) was signed by NRA President Page Yaw and HQ USAF Maj Gen Charles Bondley. The agreement has been extended by MOU since that time and is renegotiated every five years. A. Central to the Hennessy Trophy Awards Program has been the Air Force Services Office (AFSO), also known under several different names. When the Air Force separated from the Army, it was recognized that there was a need for a quartermaster-like organization. Patterned roughly after the QMC, but with emphasis on overall management guidance through the Major Air Commands rather than direction as with the QMC. The office was established under the Air Force Logistics Command (AFLC) as the command responsible for equipment, supply, and management. The original commander of the division, within which AFSO was located, was Col Dallas Knolls. He was succeeded by Col Nathan Folwell after whose retirement in 1966 a succession of chiefs presided. 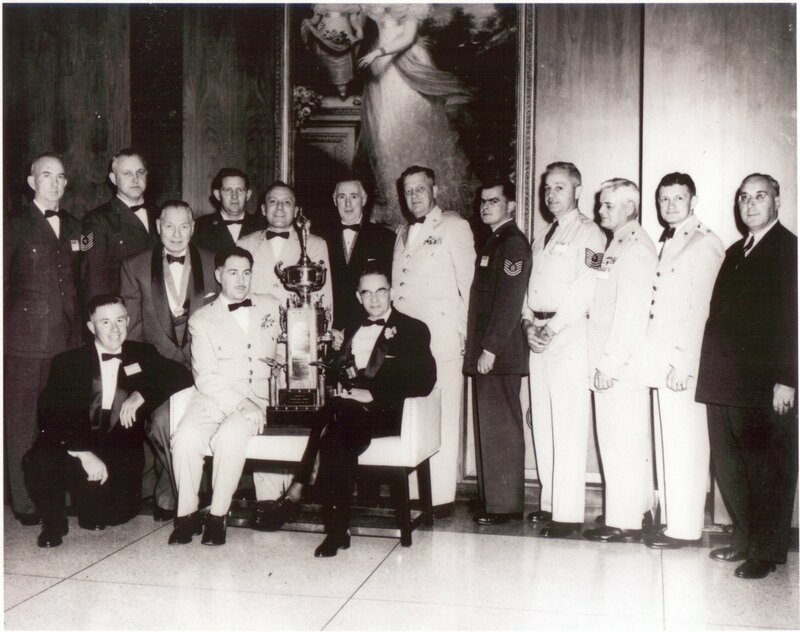 LT Col John Oroszi was Chief of the Food Division and Capt Walter Pienkowski was head of the branch responsible for the operation and management of the Hennessy Trophy Awards Program. Defense Personnel Support Center, Philadelphia, Pennsylvania from 1966 to 1979; 1979 to 1993 Tyndall Air Force Base, Florida and in 1993 found its current home in a leased office building in San Antonio, Texas. C. Until the move in 1979, the Office was a part of Air Force Logistics Command (AFLC), the major air command dealing primarily in supply and logistics. With this move, the office became an active element of Headquarters Air Force then called the Air Force Civil Engineering and Services Center (AFESC), a field operating agency (FOA) of Headquarters Air Force Pentagon (HQ USAF). The office moved again in 1991 to Randolph Air Force Base, San Antonio, Texas when Services and Morale, Welfare and Recreation merged into a new FOA. The office was renamed the Air Force Services Agency, and as it grew in size it was relocated to its current location in the city of San Antonio, Texas. A leased office building adjacent to San Antonio's International Airport allows for easy access for staff travel worldwide. Known today as the Headquarters Air Force Services Agency (HQ AFSVA) today. This office is a field operating agency (FOA), an external arm of the Pentagon with worldwide responsibilities for all of Air Force Services global support missions. Food Service is the core force multiplier, from peacetime to wartime; still today a force is supported by the food supplied, created and served any time, any place that the Air Force mission is projected in to. Some 3,700 Services specialists supply over $94M meals annually at a delivered food cost of $184M. D. Command lines have always presented difficulties, as commands and installations sought to deal directly with AFSO rather than following command/organizational lines. Due to the worldwide nature of the function and actions, this direct contact resulted in quicker action than following command lines. It also generated some friction as AFSO also dealt directly with many elements of HQ USAF. E. Today, with the reorganization of the Air Force in 1991, the Air Force Services Agency freely supports all Major Commands mission, Joint Service, Combined Command and multinational mission demands reporting directly back to the Headquarters Air Force Pentagon. A. The HQ USAF conference workshop committee, in establishing the guidelines for the evaluation, recommended that a committee be formed to insure the direction and continuity of the program. A Steering Committee, when selected, would have representation from the AFSO, its major command (AFLC), from each of the commands that would be providing a traveler, HQ USAF/LE and USAF/SG, and from the three industry food service associations participating in the program. The steering committee would meet prior to the evaluations to make recommendations to improve current and future year programs, based on input from the MAJCOMS, the Associations and prior travelers. The committee would also provide information and guidance to the current year travelers. B. Concept. From the beginning, it was felt that there could be no substitute for personal on-site evaluation of a facility to effectively rate the facilities operation and management results. The Steering Committee early on spent much time discussing evaluation concepts that would assure the best and fairest results. While it was agreed that standards for evaluation were necessary to assure uniformity in judging, it was essential that the evaluations must be the result of personal visits. This process was followed except for only one occasion when early in the program severe fund limitations and a lack of command understanding prevailed, precluding the final round visit and resulting in a highly subjective winner decision. C. The AF Form 1038, still in use today, is essentially the same as the one developed by the original committee. The relative weight for management operating procedures and regulatory aspects still prevail, although there have been changes in the weight of some elements and some changes in philosophy. The effectiveness and usefulness of the form is shown by the fact that many of the industry travelers have taken the form home with them for use in their own establishments. D. Geographical areas of evaluation. At the time of the origin of the program, the Air Force had large numbers of forces in the overseas areas. Additionally there were several major air commands located totally outside the United States. Thus, it was decided that the three areas should be evaluated and then the best of these three would be revisited. They would select a winner, a first runner-up, and a second runner-up. The areas were the Pacific area, the European area, and the continental United States. In order to balance the number of bases to be evaluated, some east coast bases were included with the European area bases, and some west coast bases and Alaska were included with the Pacific area nominees. This was in effect for several years, but difficulties were encountered in finding time and money for the second round evaluation. Attempts were made to gather the travelers in one location and to determine the winner by their collective discussions. This was not totally successful. At about the same time, there arose a perception in the minds of many that comparisons between stateside and overseas bases could not be truly made because of the differences in operational procedures and practices. Each group tended to feel that the other had an advantage. There was also a feeling that it was not possible to fairly compare and judge a small unit-dining hall with that of a large multi serving-line facility feeding thousands. Based on these factors, perceived and real, it was decided to do away with the geographical lines and establish the basis as installations having one facility and those having more than one. With some modifications, this classification has worked out well. E. Special Categories and Awards - had to be established to suit peculiar and/or non-recurring situations. (1) Air Force Reserve & Air National Guard Recognition - The work and encampment schedules of the Air Force Reserve (AFRES) (started 1980 - Present) and the Air National Guard (ANG) (1988 - Present) made it difficult to coordinate schedules with the annual Hennessy evaluation trips. Thus, it was decided to reward the best installation based on the recommendation of their Command whose food service people had evaluated their own bases during the course of the unit's training periods. AFRES preceded the Guard program. ANG actually established a large and small category when first started in 1988. They ran this program from 1988 - 1991, when it was decided to finally have one overall winner. Today, both programs proudly live on, evolving with their own unique trophies, presentations and awards. Both are recognized during the Chicago award programs. 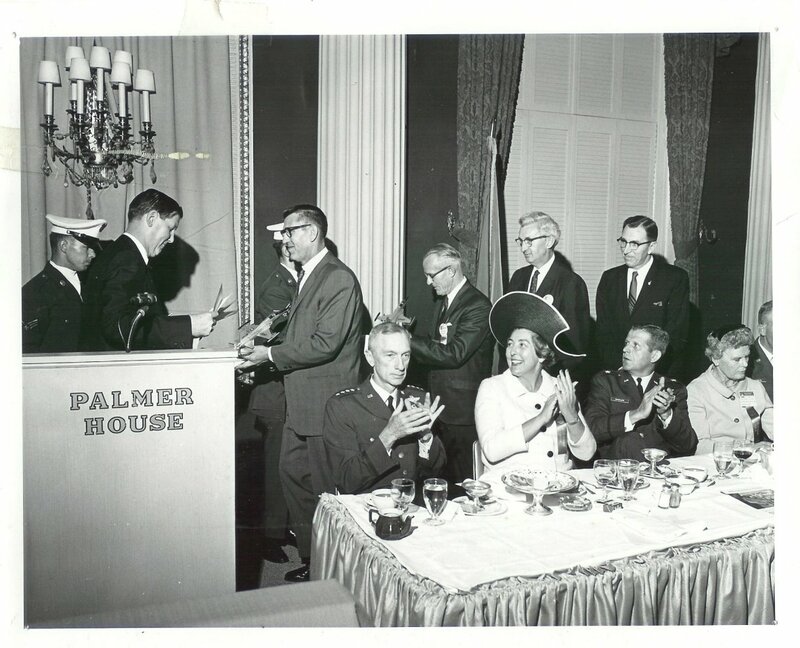 (2) Special Award (1967-1972) - During the Southeast Asia (SEA) action there were a number of food service activities; but, because of the hostile environment, it was decided that it was not appropriate for the evaluation team to do an on-site visit. Again, relying on the command food service visits, their recommendation was used as the basis for the Special Award to SEA bases. (3) Flight kitchens (mid 1980's-1991) were included in the evaluations in the early stages of the overall evaluation program, incorporated on the AF Form 1038 Checklist. On a stopover visit to an installation, the HQ USAF/LE was greatly disappointed in a flight meal experience that he had during his trip. His staff was charged with taking a look worldwide at the quality of flight feeding, surveying air and ground crews. 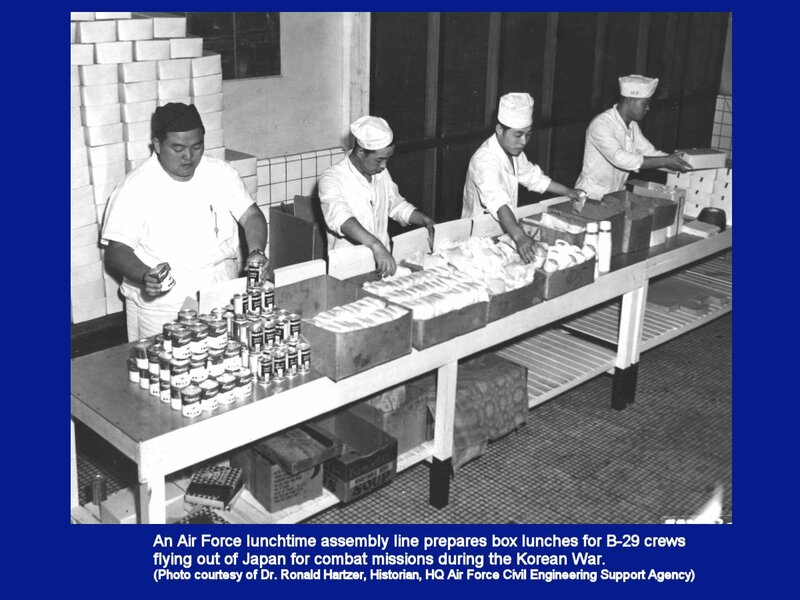 Feeding aircrews and passengers should be mission one for Air Force Food Service. After challenging the Headquarters Food Service staff with improving the program system wide, it was suggested that flight kitchens be separated from the Hennessy Awards evaluations and made the subject of a separate program. MAJCOM awards programs concentrated on turning flight feeding around, award their "best" within each command. This continued for several years until the flight kitchens improved to the point where they could, once again, be included in the overall Hennessy Awards Program. Today, they are an important part of the consolidated Air Force level program award. (4) European Small Site Award (2001- Present)- This award was added to the numerous others at the request of Headquarters, U. S. Air Forces in Europe in 2001. The basic idea was to highlight the efforts of these isolated locations scattered throughout Europe as the footprint of the Air Force presents drew down after the Cold War. The evaluation process is internal to HQ USAFE staff, funded by HQ USAFE and is presented in Chicago during the Friday evening Air Force awards ceremony. (5) Air Force Best Missile Feeding Operations Award (2001- Present)- Through dramatic realignments in 1998, it was recommended that ALL of the Missile Feeding Operations staff be reassigned to the Operational Missile Wings and work in concert with the operational missile crews. This removed some 600 Food Service Specialists from the regular career field. At the recommendation of several key Air Force Space Command Services staff members, the creation of this unique award was created to highlight the individual efforts of this unique set of Food Service Specialists. The evaluation process is internal to HQ AFSPC staff, funded by HQ AFSPC and is presented in Chicago during the Friday evening Air Force awards ceremony. - This award was discontinued at the request of HQ AFSPC with the last award being presented in 2007 & 2008. Do to overwhelming response it was brought back in 2009 and continues today. (1) The original concept of team composition, since there were three geographical areas to visit, was to have one industry representative, one person selected from the major commands (on a rotating basis), and one member from the Air Force. This latter member came most often from the Air Force Services Office, although in the first few years a representative of the HQ USAF/LE community was represented. Likewise, in the early stages the Surgeon General's office requested to be included. However, their actual support consisted only in attending planning meetings and no representative ever traveled. The MAJCOM representatives were hard to come by as, initially, the command was required to fund their travel. (2) MAJCOM participation became more complicated when the criteria shifted from three geographical areas with three teams to the multiple and single concept with only two teams. It appeared that it would be possible to drop the MAJCOM participation. Likewise, in the early days it was desirable to have MAJCOM involvement, as the Hennessy program was not well known, or readily accepted, and enlisting the support of the Services family helped to strengthen the program. It needs to be noted, however, that along the line several of the less supportive commands provided minimally qualified travelers--to the embarrassment of the Air Force. The change to multiple/single also meant there were three industry representatives for only two teams. The NRA offered to provide an additional traveler. Thus, each team would have two industry and one Air Force traveler. (3) The composition, personalities, and qualifications of the teams were based on several considerations. As the industry representatives came from highly diverse backgrounds, an effort was made to balance their qualifications so that the teams would provide equal qualifications for the evaluations. Likewise, the Air Force people were also matched for qualifications. It happened that the Air Force people often traveled more than one year. So, it was established that the Air Force member should not be on the same team two consecutive years; thus, eliminating any perception of partiality. B. Each of the Associations developed different criteria for the selection of their representatives. (1) The NRA solicits their Board of Directors for volunteers to travel. Travelers are required to be able to spend the time necessary and to be financially able to absorb travel costs. The volunteers are screened and recommendations made to the NRA president who makes the selection. The IFSEA also solicits volunteers to travel on one of the Armed Forces Evaluations. Volunteers select the Service team on which they would like to serve. Volunteers are reviewed by a committee within the IFSEA, which makes recommendations for the President's appointment. Initially, the SFM solicited volunteers. In the early days, the retiring President most often was the volunteer, the appointee and, thus, the traveler. Currently, the SFM traveler is selected from the Board of Directors. The Air Force supplies two travelers. An Air Force officer or civilian representative acts in a dual role as an evaluator and as the team chief/coordinator. The latter capacity includes responsibility for relations with travelers, itinerary development, contact with MAJCOMS and later in the planning and arrangements at the presentation ceremony. The second traveler is a senior enlisted functional representative. This representative is the "crew chief", a behind the scenes nuts & bolts expert. A well respected, senior expert in the Air Force Food Service operations team, they handle all technical aspects of the internal operations. Initially, most of the travelers were civilian members of AFSO, since there often were no qualified military members in the office. Beginning in the late 1970s, Air Force officers were selected to travel, however no Officers had been assigned in management and operations of Air Force Food Service, so they always went externally for volunteers. In the Hennessy's first year MSgt Julius Boyd was an Air Force traveler. (2) Each Association is requested to have a backup in the event of emergency. Travelers have been replaced at the last minute due to a variety of circumstances (Parks 1967, Clements, Flickinger 1972, O'Neil 2004 and others). (3) In the early days, MAJCOMS and bases had their own organic aircraft. These could be used for in-theater flights, however, for overseas flights MAC or contract carriers were used. The industry representatives were accustomed to first-class travel and often the clearance procedures at overseas terminals were tedious and lengthy. In order to expedite the travelers through the protocol area, their orders placed them as an 0-7. (General Officer Equivalent) This was a great expediter and caused no problems, except for some of the female travelers who publicized their one-star status when there were no Air Force female one stars. (1) The National Restaurant Association's membership is primarily drawn from the owner/manager level of food service operations. Membership ranges from small independents to the large chains. The NRA membership represented the entrepreneurial aspect of food service wherein customer satisfaction and profit are paramount. 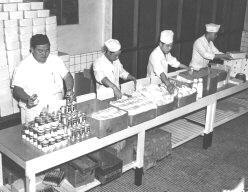 (2) The Society for Foodservice Management had its origins in industrial cafeteria food service, then the National Industrial Cafeteria Managers Association (NICMA), representing the management level of company food service operations such as Bell Telephone, NCR, General Dynamics, Detroit Edison, etc. This group later merged with an association of food service contractors that served the large corporations. The evaluation group provides the excellent management and quality evaluation necessary to a commercial operation. (3) The International Food Service Executives Association has its roots in the Stewards and Caterers Association. Initially, this organization was largely composed of those active in the operation such as chiefs, stewards, bakers, etc. This group provides a very effective evaluation program of the Air Force bases' food production effectiveness and quality. A. From the beginning, all of the major commands (MAJCOMS) have participated. On occasion a command might drop out for a year or two because of internal command problems. Within the Air Force the emphasis placed on food service is often the result of either strong command emphasis and ample funding. Not all commands are equal in funding and, thus, it occurred that a command with strong funding and command emphasis was in a position to win repeatedly. It was determined that this was not in the best interest of the competition. Thus, after a base won two consecutive years they were required to lay out for a year. This situation generally occurred in the one or few-base commands. B. All of the MAJCOMS were encouraged to participate. However, it was difficult for the ANG and the AFRES to fit their training days (periods) into the Hennessy Awards cycle that occurred in March and so they were not included. In the early years the AFRES did compete, but the performance of their nominated base was substantially below that of the other commands and they withdrew. Some years later, because of the increasing emphasis placed on the AFRES, they requested to participate. 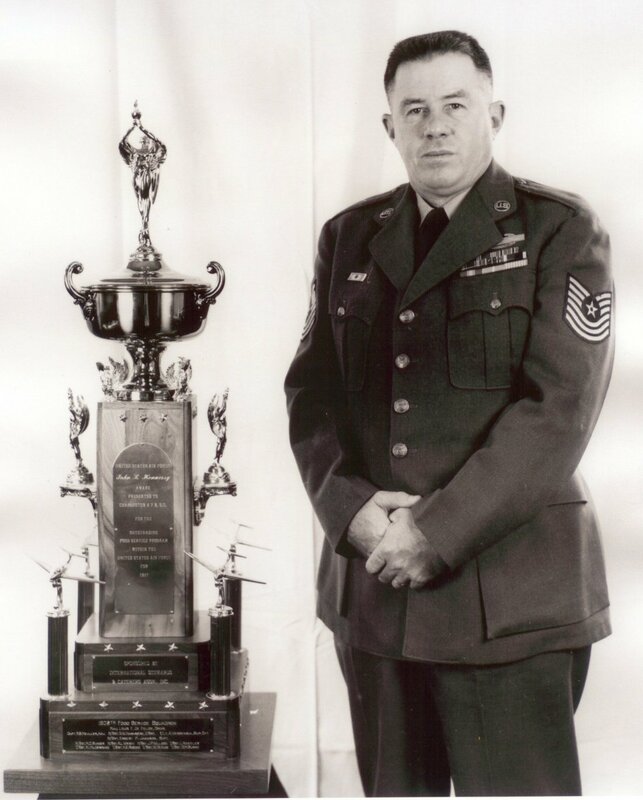 The same evaluation problems existed as before, so it was decided to allow the command evaluation to nominate a winner and receive a special AFRES award at the time of the Hennessy Awards presentation, but not to be in competition with other commands. Shortly afterwards, the ANG joined the program under the same conditions. C. A special award was established in 1967 to recognize the efforts of installations in the Southeast Asia area. Once again, for obvious reasons, it was not possible for the evaluators to visit the command (PACAF) nominee. Under this situation, the Command evaluation and recommendation was used as the basis of the special SEA award. This award terminated at the end of the war. A. Locations: The award of the first Hennessy Trophy and plaques took place (on a date I don't remember) in Ft Worth, Texas in conjunction with the annual convention of the IFSEA. The second presentation was held at the Air Force Academy, Colorado in conjunction with the SFM. The third presentation was made at the Chicago Navy Pier in conjunction with National Restaurant Association Exposition. From then on the presentations were made at the time of the NRA exposition. This tradition has continued over the years, traditionally held on a Saturday, Veterans day, 3rd week in May each year. Initially, they were at the Navy Pier. 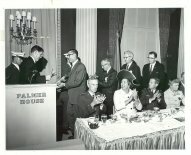 In 1963 the award ceremony was moved to the Palmer House where it was held until 1982 when the Palmer House underwent a major renovation. Since that time it had been held at a variety of locations; the Hyatt Regency, the Chicago Hilton, the Marriott and back to the Palmer House. The award ceremony moved back to the flagship hotel for the NRA, the Hyatt Regency in Chicago until 2001. Since that date, the NRA has elected to relocate its Chicago flagship to the Sheraton, downtown Chicago located directly on the Chicago river. B. The program format has remained substantially the same since it came under NRA sponsorship. The underlying idea was to offer a program that emphasized the respect for the Air Force and its efforts, honored the airmen (and women) who achieved the victory, and be of continuing interest to an audience composed principally of NRA officers and board members and selected industry dignitaries. It has always been difficult to achieve a balance between year-to-year sameness to the NRA members and the novelty and newness to the Air Force participants. In 1994, at the recommendation of two key AFSVA enlisted staff members, it was conceived to add an audiovisual "centerpiece", a video montage of what was seen by the travelers during their month long trip. This short video tribute culminated both traveling teams best of the best and replaced the old slide show presentation by NRA travelers. These video centerpieces have evolved each year and become a "poster child" for Air Force Food Service professionals worldwide, as well as continuing to sell the Air Force in this mixed audience of professionals. In 1999, at the suggestion of the NRA, the normal format of an awards luncheon was changed and a spirited awards breakfast was set. This format now allows attendees of the Hennessy Awards a longer opportunity to attend the NRA's show, exhibits and seminars held out at Chicago's McCormick Place convention center. C. The original trophy was purchased by the Air Force and awarded to Charleston AFB South Carolina. A second trophy was purchased and awarded by the SFM to Fuchu AS, Japan. This trophy was a traveling trophy and was used through 1980 and listed both single and multiple winners on the plates located around the base. A third trophy set was provided by NRA to better support the multiple/single category awards beginning in 1981. Each trophy contained the name of the winner on a plaque on the base. The respective large and small category trophy's rotate annual from the winning installation back to the NRA and then are again presented at the awards ceremony to the new category winners. An additional expanded base to each trophy was added in 1991 to accommodate the winning bases through future years. As the trophies revolve each year the previous year's winner returning the trophy receives a replica plaque commemorating their award year with the original trophies plate on it. MAJCOM participants are recognized at the orientation ceremony by military distinguished visitors and presented a participants plaque. The runners-up plaques and the AFRES and ANG plaques do not revolve. This practice continues today. A. The sponsoring organizations approach their funding commitment differently. (1) The NRA hosts the steering committee meeting in January except when the meeting is not held at the NRA headquarters. They also now host the Friday evening NRA President's Reception for the winners of the Hennessy Awards and travelers. They sponsor the Hennessy Trophy Awards banquet and pay for the Air Force attendees and the distinguished guests. They also provide for maintenance and refurbishing of the trophies, the new plates that are put on each year, and the special awards and runners-up plaques. They lend assistance in housing, accommodations, and NRA Exposition badges for the Air Force attendees. Travelers are responsible for expenses incidental to the steering committee meeting and the evaluation trip except those paid for by the Air Force. (2) The IFSEA provides a per diem to their traveler while on the evaluation. The traveler is responsible for costs of the steering committee meeting and other costs not borne by the Air Force. (3) The SFM provides support to their traveler much the same as does the IFSEA, and is supported by the Air Force in a similar fashion. B. The Air Force funds for the balance of the program. There have been some very lean years. Along the way, there have been numerous efforts to reduce travel, consolidate with other USAF award programs, do the evaluations by rating sheets, have the program every other year, etc. (1) The MAJCOMS bear the costs of the evaluation of their installations. While this is irregularly done in conjunction with regularly scheduled staff visits, such travel requires considerable expense and commands deserve much credit for their support of the program over the years. The commands also bear the costs of travel and expenses incident to the Hennessy Trophy Awards presentation in Chicago. C. HQ AFSVA bears the costs of its travelers and staff to the steering committee meeting. AFSVA also funds for the transportation and other allowable costs for industry members on the evaluation trip. They pay all the costs of their travelers. AFSVA also supports the costs of their travelers and staff to the Hennessy Trophy Awards presentation program in Chicago. A. The Hennessy Travelers Association (HTA) was born of the need to provide an activity for airmen who attended the Friday night orientation program. The initial event was a beer and pretzel bash after orientation meeting that was supported by donations from Vernon Cordell, Jack Webb, and Roger Merwin. After two such events (with additional contributors) the event went to Don Roth's Black Hawk. The organization was born to officially support the Friday evening event. This continued until 1984 when the NRA recognized a serious conflict among their director/travelers with the NRA President's Reception and the HTA social and decided to include the Hennessy airmen in the President's reception and consider it the Hennessy Reception. B. The HTA is governed by a chairman with direction from board members (prior travelers from all associations and the Air Force) at an annual meeting. A nominal dues is collected to underwrite the various programs the HTA annually supports. C. An Award of Excellence is made to an individual selected by each evaluation team from among the installations they visited as the most outstanding food service person. These individuals are recognized at the Hennessy Trophy Awards Ceremony and by a scholarship program that can be used towards continuing education and advancement within industry. Since 2002, the HTA has been blessed with industry corporate sponsorship by the Otis Spunkmeyer Corporation underwriting these scholarships as well as individually recognizing each HTA nominee for the annual overall Air Force level awards. D. In 2005, the HTA undertook an initiative to both celebrate 50 years of excellence and establish a permanent entity, the Hennessy Travelers Association Educational Foundation. The sole charter of the foundation is to provide continuing educational opportunities for Air Force Food Service professionals. Two major projects were taken on by the HTA, first in celebration of the 50th Anniversary, 50 Air Force Food Service professionals from around the world where treated to a trip to Chicago to the Hennessy Awards celebration. The second major project was a week long custom tailored educational event. This event was held at the Culinary Institute of America (CIA), Greystone out in Napa, California. A week long agenda capped off by a powerful CEO roundtable at the end of the week was developed. Both events where well received and cherished by all that attended. Active duty, guard and reserve from the Air Force attended as well as corporate executives from a cross-section of the hospitality industry. None of this would not have been possible without the vision of two prior travelers, Ed Tinsley (NRA) and Russ Benson (SFM). Of course as you can imagine, the HTA took on fund raising efforts that have never been seen before to support both events. An outpouring of industry sponsorship ensured both where memorable events. The HTA continues to plan and seek corporate sponsorship to provide additional opportunities for Air Force Food Service professionals. E. The HTA provides assistance on request from bases for visits by past travelers to improve their food service operation. Several past travelers recently completed an HTA handbook for future travelers to assist and prepare them for what is truly a lifetime memorable tour. It contains tips and new information like military officer and enlisted rank and grades. The HTA has future plans to expand the organization into potential placements of qualified candidates into industry after their Service to their county. Contact the HTA for more information. A. Like any successful idea, program or process, the Hennessy program has evolved in many ways over the course of the award. From starting out as an idea to exchange suggestions from industry leaders with the armed forces through that spirited award type process, the traveling teams themselves had made key recommendations to further guide the program. Changes to the types and amount of trophies from just one to two actual exchange and rotating trophies was one of those very first recommendations. The idea to leave a replica plaque in place of the returning trophy made the traveling trophies what they have become today. These trophies are not a historic record of the countless efforts that have both come from those traveling teams and all of those that have not only served their country but have served customers in the chase for excellence. These coveted trophies are simply priceless and have seen the world over, in many far off lands as well as right here at home within the United States . . . if they could only talk, just think of the stories that they could tell. B. Of course the evaluation process itself has also been constantly updated. That basic Hennessy evaluation checklist used today is still the key document, the foundation to that "open book test" all are trying to perfect. As the Air Force has changed so has the checklist. Many areas have been consolidated and concentrated into more manageable areas. One of the biggest and most extensive changes to the evaluation checklist was introduced in 1998, when both of the traveling teams made recommendations that the current eight evaluation areas be combined into the five functional areas that there are today. In 2001, the point system on each sub evaluation criteria was eliminated and the accumulated points for that overall functional area was used as the basis for ranking and rating, eliminating "hair splitting", again made by the recommendation of the traveling teams. C. One of the most unique changes suggested and then implemented was made by the 2001 multiple team as they hammered out their final selection of their overall HTA nominee for the award of excellence while on site at Ramstein AB, Germany. After almost 5 hours of debating and arguing on their selections, the difficult choice was made. On the minds of the team was what could they do to ensure that at least all of the competing HTA nominees at least made it to Chicago to see why they want to continue to compete and hopefully win the coveted Hennessy Award. The idea hit them to withhold the announcement of the overall winners for both teams as to the Air Force HTA overall winner! What was discussed was that the annual announcement of the Hennessy Award winning bases traditionally also followed with the announcement of the over Air Force nominees for the two HTA winners. What was apparent back then was once this announcement was made, it drove who went to Chicago to receive the participant plaques for their MAJCOM. In most of the cases the local food service officer or superintendent went, simply as a point of economics, while also attending an annual workshop or the NRA's tradeshow itself. What was missing was that the "youth" of the Air Force, those young and inspired individuals, never got that once in a career opportunity to see and feel Chicago. So, the idea was suggested to Headquarters Air Force Services and the Air Staff. Initially, it was met with some challenge and questions, however once explained, it was adopted and is still announced annually in this manner. It has ensured that many more young eyes get to Chicago seeing all the events and activities, hopefully inspiring them to motivate other teams to work even harder on ultimately wining a Hennessy Award. A. What better place to come and experience the marvelous and successful industry as the hospitality career field that both the sponsoring associations and the Air Force food service players both are rooted in. This is the original home to the National Restaurant Association and many of the supporting industry companies. There is great heraldry in both. As travelers once again gather with fellow travelers and see friends that they have also watched perform daily routines, there have been some unique traditions and key spots to share stories, discuss how to improve and simply to just enjoy Chicago and all that it has to offer. B. Miller's Pub - The original "gathering spot" for those initial planners and travelers. 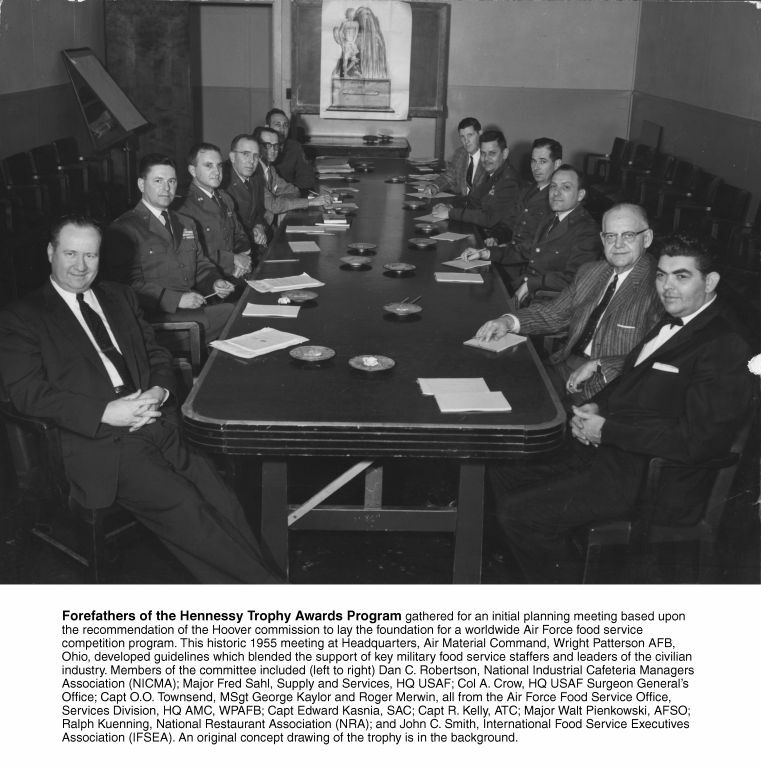 This has a recorded history of being the spot where the Hennessy Travelers Association was first conceived as an idea to do more for those serving their country as an Air Force Food Service professional. Miller's is a Loop tradition, and one of the few places in the area offering bar service until the early morning hours. "We're not trying to be fancy. We're taking care of the cross section of people who are coming into this area," says Van Gallios, one of the four brothers who bought the restaurant in 1950. Known for its ribs, chops and steaks, Miller's also offers Italian dishes, seafood, salads, egg dishes and lots of sandwiches. "We're much cheaper than a tablecloth restaurant," says Gallios. Meals average $13 with drink, though there's also lobster tail for $32.50 and six ribs of Greek-style lamb chops for $22.95. Only a block or so away from Orchestra Hall and the Art Institute, Miller's provides reliable meals at late hours in a neighborhood with fewer dining choices than one might expect. C. Kitty O'Shea's - Some years ago, we have been told around the mid 1970's, someone started the "gathering". The tradition is that after the formal events of orientation and special functions conducted by both the National Restaurant Association and the Air Force participants, they would "get out of costume" and find a local watering hole with some of that only Chicago type of entertainment. Most likely while being housed within the now famous Hilton Tower's of Chicago, someone probably heard a traditional Irish band belting out some of those old Irish classics. That location, Kitty O'Shea's has become the gathering spot, usually around an hour or so after formal festivities have ended for the evening. It has been known that the Air Force crowd could take over this small corner location. Over the years one could witness a four-star general in the corner booth with some of the Air Force's most junior food service personnel. Both enjoyed the camaraderie and exchange of what has already overwhelmed many. Now it has been said that many stayed over the years longer than they should have. Years ago, Saturday's awards presentations were a luncheon, prior to the opening of the NRA's tradeshow. But, like we've stated before, this two has changed over the years. Since 1999, the Saturday program is now a breakfast that promptly starts at 0800. With this, the gathering has normally ended early than in years past when some where coming home as the sun was coming up. Kitty's combines over 20 different bars into one Irish masterpiece of a design, resembling Dublin circa 1899. All the good beers are flowing here, from Guinness to Harp to Killian's, and everything in between. For a good, long night of getting messy, make Kitty O'Sheas your pub of choice. In 2013 . . . a 57 year tradition narrowly escaped being abolished with all of the Armed Forces facing restrictive travel budgets, not allowed to travel TDY at all to support the annual Hennessy program and sequestration directed further budgetary mandates. Through the unwaiverable efforts of all of the supporting associations, the HTA worked tirelessly with the NRA and its newly formed military foundation to ensure some type of inspection and on-site evaluations continued. Its through these combined efforts the Hennessy program continues . . . please continue to express to senior armed forces leadership the importance of on-site evaluations, food and life safety compliance inspections to support program integrity!